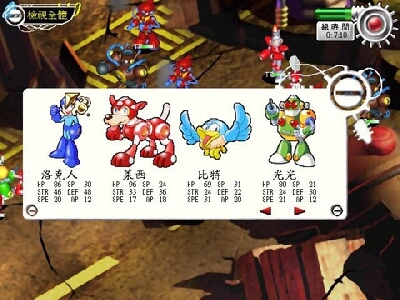 Rockman Strategy (Or the "Rockman War" as it's written in chinese)! A game unknown for five years after it's initial release. A game I finally own. A big thanks to Rockman X DRN for sending me what I have! Information comes courtesy of Plantman who read some of the initial bits of information on game screens and the like. Although this game was rare when I first found it, it's not quite as rare anymore. Copies exist that are pretty obtainable. Still, I'm satisfied that, for a long time, I was the only one with any relevant information on the game. Actually, I'm pretty proud to have brought at least one game to the attention of the community as a whole. Before me nobody knew a game called "Rockman Strategy" ever existed. According to my research it was released in October 29, 2001. It's a PC game released in Taiwan and possibly other parts of Asia as well. The art was done by renown artists Liu Mingkun and Hu Meijiao. But, I think what is most important, is that it's actually endorsed by Capcom. This game is an official Rockman product! Capcom licensed the game to be released in China by the "Dreams Come True" corporation, and despite what some nuts think, getting a licence actually makes a product official. It's the difference between the games in my pirate section and the Megaman toys made by Bandai. One is an official product given the official nod by Capcom, the other violates intellectual copyrights. I hear talk that this game is a pirate. That is not true. Granted, there *are* pirated PC games in the Asian market. I have done research and have a list of all the more popular Asian pirate PC games as well as all the official Asian PC games. This is an official one. 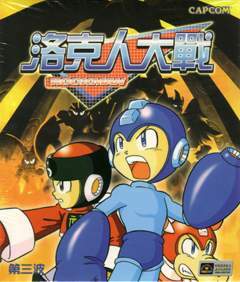 Capcom has licensed games specifically for Asia, just as it licensed games specifically for North America (The MM PC games, the MM Tiger games, and the Game Gear game) and Japan (Rockman & Forte WS). Capcom also licenses for TV shows, mangas, comics, and toys. Rockman Strategy is no different from these other products. It has a license and Capcom gained money from it being sold. It is therefore an official Rockman product (if not a Capcom product). Every single store and review for the games makes a point of mentioning this. It's a fact people. Face it, we're not the only language Capcom licenses things to. Yeah, we're not the center of the world, go figure. The ever-losing Dr.Wily never gave up on his dream on conquering the world. On his island lab, he was still attempting to develop and create his Robot Masters. This day, when he was still undergoing various experiments, there were intruders! Is it Rockman? No. but instead, unknown aliens similar to the Space Rulers arrived right in front of Dr.Wily’s front door. Under the danger of being killed, he had to cooperate with these Aliens. Several Months later……. Rock and Dr.Light were invited to a Plant exhibition set by an elementary school. On their way, they were struck by a huge earthquake. Things even worse were happening; the plants in the elementary school and around the world are dying in a fast speed. News flash has reported that four giant fortress has arisen from underground. And the plants around these places were dying even faster. Dr.Wily’s face has appeared on the screen, in front of every prime minister and presidents of the world. Threatening that if they will not surrender this world to him, he will make plants become extinct from this world. Right now, the air provided for Humans were starting to run out as the hole in the ozone layer widens. The world is under a terrified state. Rockman has not much time left, as he takes all his friends to fight the devious Dr.Wily. To crush his evil plan once more time. But someone is looking in the dark……. It turns out the sun and moon gods are out to bring life to their planets and meant no real harm. But, when they revealed their true intentions to Megaman Dr. Wiy turns on them and uses them for his own schemes. When Rockman defeats Wily Dr. Light creates a device to help restore life to their planets. The Constellation Droids then return to their planets in peace. The entire story can be read in the game's script. It's all contained within a document called Tt00012. This is actually a text file and I believe translating it will make the entire game in english. However, nobody has been up to the job. Maybe someone out there in internet-land will be able to make a "patch" consisting of edited images and this file translated. In the meantime I give you the raw file in HTML form with proper encoding information. Babelfish is unable to translate it at all if you try doing the page all at once, but it's able to translate small portions of text if you copy-and-paste it into the text area. Incidentally, the reason the text in the game looks like garbage on English computers (whose who have the game know what I'm talking about) is because our computers are not set to display Traditional Chinese text automatically. Since the document isn't formatted, you get garbage. Easy: There will be no Gold system in this game. All there is are parts. These parts are essential to the party. Creating: Using parts, you can create various weapon chips, and body chips. You’ll be able to boost a character’s power through that way. 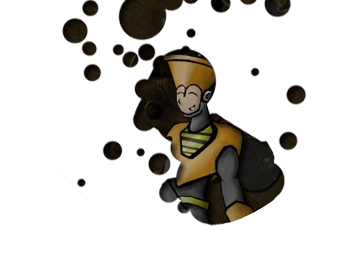 Through the use of chips, you can create a “Chain” Using chain attacks you maybe able to boost the attack by 25 times! In the game, every character has special attacks. Every character has something exclusive to them. In a way, it is similar to Super Robot Wars series, but it’s also different. The player has to pick carefully of what to use on which situations. When a character has enough EXP. He/She can release their ultimate attack. Every character has 2 to 3 ultimate attacks. If you want to win, Ultimate attacks would be essential, especially when every stage has a Robot Master. So power yourself up. The most interesting thing in the game would be Dr.Light’s lab. Every time you finish a stage, you can return to the lab and use parts from the battle to power up. Even if they give you a guide to the lab at the start of the game, there’s much more you can do. The lab has many uses, Rockman and co. and develop chip here. Using them to power-up and/or create. Some may have data on how to defeat a robot master. Like the games before. This time it’s still somehow similar to the original games, as every RM has their own terrain in battle. Some terrain needs special items to pass! The polish on this game is not very good. As a result several of the Constellation Droids have the WRONG SYMBOL! Picture perfect, hunh? Sagittarius = The correct symbol. With artistic licence. And "X" is allot like his true symbol so I'm counting it (the intent is there). Aquarius = The designs on his vase just might be a mangling of Cancer's symbol. So that' 7 out of 12. Yeesh, Dream Comes True guys ...... you need to clean up your act a little. Pices is supposed to be two fish joined by a ribbon and yet the robot master Pices is half dolphin. To Dreams Come True Corp.: Dolphins are mammals, stupid! Gemini's ...... odd appearance has roots in an unlikely place. After Needle noticed the designed looked like a costume found in the Phantom of the Opera (broadway cast, masquerade scene; we have a book on it), I did some research to see where the look begins. Oddly enough, I can't find any reference to any Gemini with that look .... but I did find a Hindu god called Ardhanarishvara. (S)he's Siva; half-male, half female; the ultimate form of god. At present that's the closest I can get to some sort of explanation for THAT guy. 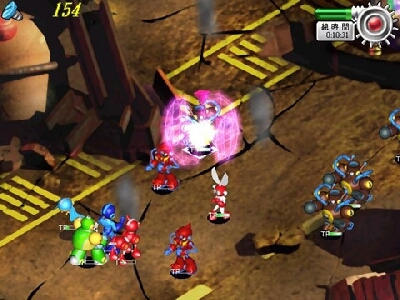 Rockman Strategy is one of the few games without a metool (of any kind). The other games are Megaman 2 and 3 for the Tiger handheld systems. The "sprite" of Gutsman in this game is the worst rendition of the character ever! This includes Captain N and Nintendo Power renditions. And all custom sprites I have seen from anybody to this date. And, yes ..... this is a fact and not an opinion. In the Rockman Strategy script Burstman is misnamed Grenademan. After Rockman Strategy the only robot masters from the main series (MM1-8) that are never used in a game other than their initial appearance is down to: Gravityman, Blizzardman (MM7 cameo non withstanding), Windman, Clownman, and Grenademan. Nobody loves them. Fan is a new character in the game. My early research talks about a "Chinese Culture Soldier", and I guess that's Fan. Translating the symbols in Babelfish had me calling him "Buddah-Luo", bit it's not anything like that and I can't help but wonder how Babelfish got it so wrong. Fan is absolutely unnoteworthy. Despite his prominent appearance in the intro video, Fan has no dialogue in the game. Good going, Dream Come True! Just as the subheading says! While the game's screenshots make the game look 3-D it's actually not. The backgrounds do appear to be rendered in a 3-D program, but they aren't 3-D; and the characters are sprites made in a 3-D program. Somewhat disappointing, I know. Still, it does allow me to rip all the graphics effectively and completely! All art and sprites and images were found in a data folder in the game, but they weren't suitable for posting on the web. It took me a VERY long time to compile them all so I don't really want to see them everywhere tomorrow. To this end I've put a small watermark on the images because, believe it or not, I get a bit of pride knowing I was the very first to debut these robot masters and sprites. Few believe I was the first to write a Sprite Tutorial since they became popularized, so maybe people will believe I was the first to debut these robot masters in the future. After deciding to play through the game I decide that it's high time to find a way to cheat at it. The solution is obvious: use Cheat O Matic (included in the Megaman PC games downloads). Since the words are unreadable, it's just about the only way to make any headway into the game. Sadly, because the game uses lifebards the actual hit points for characetrs involve a bit of investigating through the menu system. However, to save you some time, MM starts with 86 hit points and 32 "magic" points. At his highest level he has 138 hit points and 79 "magic" points. You will probably want to freeze these, as well as the timer, using Cheat O Matic. Each battle lasts only 30 seconds. No matter what you shoot at him, Capricorn only takes 1 hit point of damage. After the battle, Capricorn heals 14 hit points off himself. So, there you have it. Since the battles always ands, and since you can take on;y one hit point off at a time, Capricorn is night unbeatable. Even if you cheat yourself unlimited health, Capricorn can't be beaten normally. This is why you must use Cheat O Matic to freeze the timer. It will still run, but if you select the second option on the battle screen (the high damage attacks) it will reset the timer to what you had it set for. Unfortunately, the numbers for Capricorn's health were never given, so it's pretty much a game of patience as you widdle away his health, one hit point at a time. Visit the Rockman Strategy Gallery. Every image in the entire game is viewable! View the Game's Script (in Traditional Chinese). Copy and paste desired text ares into babelfish for a "translation." Download save states that take you directly to the end of the game (and the level prior to the end as well). Download the Soundtrack. Ripped directly from the second CD.